Earlier today in Dublin’s High Court, Ulster Bank successfully sought permission to serve bankruptcy proceedings on Sean Dunne in the United State. The move has left a lot of people scratching their heads. RTE’s report indicates Ulster Bank wanted to serve the papers on Sean at a court hearing on Friday this week. As far as can be established this evening, there is no hearing scheduled for Friday and it will probably be a fortnight at least before the hearing – cancelled yesterday because of winter storm Nemo – is rescheduled. What is apparently taking place on Friday this week is the long-awaited deposition of former NAMA employee Kevin Nowlan who was the asset manager involved with Sean Dunne’s loans. But Sean Dunne wouldn’t be expected to attend that deposition. And in any event, Ulster Bank knows the address of the Dunnes, we all do – it’s 421 Field Point Road, Greenwich, Connecticut, CT 06830, USA. We even know the Dunnes’ attorney and their address. And in Connecticut, there is no need for personal service, you can apparently just send the documents recorded delivery. So, what on earth is Ulster Bank up to? And given the likelihood that any attempt to bankrupt the Dunner in Ireland would prompt a voluntary application for bankruptcy in Connecticut where the Dunnes have been living for at least two years, why? Remember all the Judge has done today is granted permission to serve bankruptcy papers in the United States, if the bankruptcy jurisdiction was disputed, and the signs are that it would, then there would be a further hearing. It would be interesting to establish if there has been any co-ordination between NAMA (owed €185m by Sean Dunne) and Ulster Bank (owed €164m by Sean Dunne), but the chances of them providing comment is practically zero. NAMA has not been having an easy time in its pursuit of the Dunnes, with the Connecticut courts firstly refusing a freezing order and then the Dunnes winning the right to have NAMA employees, including Kevin Nowlan deposed. It is understood the Dunnes are convinced that they will be successful in having proceedings thrown out any way for lack of jurisdiction. Would bankrupting Sean Dunne place a further stay on proceedings, or even mean the proceedings had to be started afresh? Would the bankruptcy offer NAMA a face-saving means to abandon its pursuit of the Dunnes? Who knows. There is also the small matter of Ulster Bank’s connection to another case, the Mavior v Zerko Limited (“Zerko” is the name on the Court Service, it may be “Zrko” or “Zyrko”) case where a company connected to Gayle Dunne is seeking costs of refurbishing the Ballsbridge hotels after the flooding in 2011. Zerko is owned by Ulster Bank, and might this latest machination be aimed at forcing a settlement? Winter storm Nemo led to the cancellation of a key NAMA and Sean/Gayle Dunne hearing in the Connecticut superior court yesterday. Apparently, the hearing, which will deal with the Dunnes’ contention that the US courts don’t have jurisdiction over the NAMA claims, has been rescheduled to this coming Friday 15th February, 2013. But in a surprise move this afternoon, in Dublin’s High Court, a non-NAMA bank, Ulster Bank has secured permission to seek to have Sean Dunne bankrupted in Ireland, where he will presently face 5-12 years of bankruptcy as justice minister Alan Shatter has not yet signed the commencement order for the new Personal Insolvency Act which would cut the bankruptcy period to three years. RTE reports that today in Dublin’s High Court, Judge Dunne – incidentally, one of Sean Quinn’s two judicial nemeses – granted permission to Ulster Bank, which last year obtained a €164m judgment against the former “Baron of Ballsbridge”, to serve bankruptcy papers on Sean in the US. To be clear, Ulster Bank is seeking an Irish bankruptcy but since Sean is now mostly living in the United States, permission is required to serve the papers on him there. Apparently Ulster Bank want to serve Sean with the bankruptcy papers this Friday at his NAMA hearing in Connecticut, where the Dunner is expected to make an appearance. It is hoped that there will be photographs and tweets from the Friday’s proceedings, exclusively available here. Bankruptcy terms in the US are far more lenient than in Ireland, either at present or even when the new Personal Insolvency Act comes into force. Sean already has a €185m judgment against him in favour of NAMA, and with the collapse of the Irish property market – residential down 50% from peak, commercial down 67% from peak and development land down 90% from peak – Sean has little hope of satisfying the judgments. NAMA has not sought to make anyone bankrupt so far, has stated it is neutral on bankruptcy jurisdiction and seems to generally take a more relaxed position on bankruptcy compared to some banks. During the usually-mindnumbing questions to An Taoiseach in the Dail this afternoon, Enda Kenny was asked about this summer’s G8 Summit in Fermanagh, and as is his wont, An Taoiseach rambled off about everything and anything, and after pointing to the large Irish investment in the United States, which apparently supports 100,000 jobs there, Enda went on to say that at the recent Davos summit, he discussed communications investment in Myanmar (Burma). Enda mentioned talks with that nice man, Bill Gates, but he didn’t once mention Denis O’Brien, who also happened to be at Davos and who is presently throwing much of his resources in securing a mobile licence in Myanmar, which in 2012 was ranked 172 out of 174 by Transparency International in their table of the world’s most corrupt countries. Denis told a High Court hearing last week – in a case examining his claim of defamation in the Daily Mail newspaper – that he was based in Malta because 95% of his business was outside Ireland, “from Fiji to the Caribbean” He was responding to the proposition that he had a flat in Malta to reduce his tax bill on hundreds of millions of dollars. So, it is not exactly clear what benefit Ireland can derive if Denis does secure a mobile licence in Burma. And consequently, why An Taoiseach would involve himself in any venture to invest in Myanmar. Would Enda be supportive of investment in North Korea or Zimbabwe? Now, despite the hostility on here towards Denis and his control of Irish media and the adverse findings of the Moriarty Tribunal – findings, which Denis rejects and claims have no legal standing – it seems well-established that Denis is a highly successful businessman who has built multi-billion euro businesses in the Carribbean, central/south America and the Pacific. And as he will tell you himself, he supports hundreds of Irish jobs via several companies including Siteserv, Communicorp and Independent News and Media; and although he mightn’t be a philanthropist of the stature of an Andrew Carnegie, he has a vast history of supporting charitable causes, including the Irish international football team. On the other hand, the justice minister says An Garda Siochana is still seeking advice from the Director of Public Prosecutions over any possible action resulting from the evidence, hearings or findings of the Moriarty Tribunal, a Tribunal which reported in March 2011, 23 months ago. And whilst such deliberations continue, it seems inappropriate for the Taoiseach, who belatedly accepted the conclusions of the Moriarty Tribunal, to be potentially promoting the business interests – Enda didn’t mention Denis today, but if he is supportive of communications investment in Burma, then that should be of direct or peripheral benefit to Denis – of a man against whom a Tribunal reached such adverse findings. News from Iris Oifigiuil today that Seamus Ross’s company, Andiamo Properties is being liquidated with Stephen Tennent of Grant Thornton appointed as liquidator on 30th January 2013, following an extraordinary meeting of the creditors of the company. Andiamo hit the headlines last January 2012 when a judge rejected a bid by the company to avoid a €3m VAT liability after it had engaged in what was called a complex scheme in the sale of houses at Taylor’s Hill, Rathfarnham, and Applewood, Swords. There is no evidence to link the company to NAMA, the current directors are Michael Keogh (46) and Kenneth O’Brien (65) – Seamus Ross (60) resigned from the company last October 2012, though the company record still shows the 99%-shareholder to be Jersey-registered company, Raburn Investments Unlimited. Seamus Ross is most associated with Menolly Homes, and he has been cooperating with NAMA with the sale of his property. He is one of the so-called “Maple 10” group of Anglo customers who clubbed together to buy Sean Quinn’s stake in the bank. What now for David Drumm? There are so many loose ends after last week’s liquidation of Irish Bank Resolution Corporation which the Government claimed was pre-planned for months, but which appears like a Keystone Cops episode on here. One of those loose ends is David Drumm. David was the CEO of Anglo between 2005 and 2008 after Sean Fitzpatrick stepped down from the role in 2005 to became Anglo chairman. Both David and Sean left Anglo at the end of 2008, and David headed west to Massachusetts with the advice still ringing in his ears “don’t stay in Ireland, they’ll never forgive you”. David had about €10m in loans from Anglo, so in addition to being at the helm and the object of national ill-sentiment, he actually owed us money. The money went into Anglo shares which were wiped out, so David had financial problems and was in discussion with Anglo, when in a surprise move, he filed for bankruptcy in October 2010. 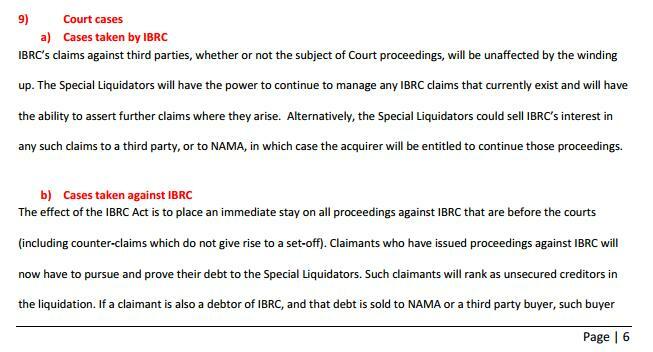 There followed a flurry of bad tempered legal challenges where IBRC sought to have the bankruptcy declared invalid, and separately IBRC seemed to be considering filing claims for losses. There are quite a few people who regard the pursuit of David as uneconomic and little more than politically-motivated activity aimed at bringing down a deeply unpopular part of the banking collapse. At the end of 2012, Minister for Finance, Michael Noonan refused to provide even an overall total of IBRC’s legal costs, citing commercial confidentiality, but the betting on here is that the pursuit of David Drumm is not economically justified. So, the Special Liquidator can continue the legal action, but under normal circumstances, he would have to justify such a move on economic grounds. David has already complied with IBRC’s wishes with re-transferring his share in the former family home in Abington, Malahide which has now been sold to satisfy his debts, and it seems that both US homes, at Stage Neck Road where Charlie Bird paid a visit and in Wellesley, are sold or on the market, again to satisfy the bankruptcy creditors. [UPDATE: thanks to a sharp-eye member of the audience who spotted on US estate agency website Zillow, that the property at 73 Old Colony Road in Wellesley has now been taken off the market] So what is left for IBRC to get from David? And if the answer is nothing, then will we shortly see David set free? No, the above is not news, but you might be interested in whether or not an asset which you 100% own is being sold for the best price. This blogpost examines the sale. First up, some history. Once upon a time, there was this organization which had a strange description for its activities – it was known as a “bancassurer” and its name was Irish Life and Permanent. The two main activities of this company were banking and life assurance. The bank was known to you all as Permanent TSB or PTSB and the life assurance company had a number of brands but you will have mostly known it as “Irish Life”. Now, the media might have goaded you into thinking that Michael Fingleton and Sean Fitzpatrick were together solely responsible for the collapse in Irish banking. But that is rubbish. Not only has AIB needed a €20bn bailout, but to date, Irish Life and Permanent has needed €4bn, and the betting on here is that PTSB will need more. Not only that, but PTSB has been implicated in shenanigans at Anglo where €8bn of deposits were carouseled at year end to flatter the books of Anglo. But can you name the CEO and chairperson of Irish Life and Permanent in 2008? No? There’s a reminder of all the CEOs and chairpersons in the six state-guaranteed banks here. And like the other basket cases on the Irish banking landscape, Irish Life and Permanent had its bad and less bad parts. The life assurance business is reasonably profitable and doesn’t have legacy liabilities on the scale of the bank; the bank, which was most prolific in offering tracker-rate mortgages during the noughties property booms in Ireland and England, which given the ECB main interest rate of 0.75% and the Bank of England base rate of 0.5% have turned out to be spectacularly loss-making. So what the Government did was divvied up the €4bn bailout, and it is the Government which now owns 100% of Irish Life and 99.5% of PTSB. The Government has been trying to flog Irish Life for two years but the prospects for the European and Irish economies has been so bad that no sale has progressed to a conclusion. That is now set to change with the betting that Canadian life assurance company, Canada-West Life will seal the deal in what junior finance minister, Brian Hayes, recently said would be “the coming weeks”. Word on the street is that a deal will be announced by 28th February 2013 and that the sale price will be just over €1.3bn so the Government will claim a small profit on the transaction. Are we getting the best price? Given the apparent change in sentiment after last week’s promissory note to sovereign bond exchange, should we hold out for several months to see if a markedly better price can be obtained? Should Irish Life be subdivided and sold as separate units? In the Dail last week, the Sinn Fein finance spokesperson Pearse Doherty posed a series of parliamentary questions to the Minister for Finance, Michael Noonan. We didn’t learn very much but it seems that the “vampire squid” itself, Fine Gaeler, Peter Sutherland’s Goldman Sachs has been leading the sale since April 2011, a month after Minister Noonan was installed in the Department of Finance. Minister Noonan is not prepared to give us any detail on the sales and marketing process so that we might get some degree of confidence that the price has been maximized, and should any Department of Finance official leave to join the buyer in the coming months, then the safeguard against conflicts of interest is at a minimum a one-month notice period for some of the 10 NTMA secondees to the Department of Finance, and of course they must cross their hearts and hope to die before they disclose or act upon privileged information obtained during the course of their work at the Department of Finance. These are the full parliamentary questions and responses. Deputy Pearse Doherty: To ask the Minister for Finance the process adopted by him to sell Irish Life which has been purchased by the State for €1.3bn; the key dates in the selling process; the providers of any services to the State to facilitate the sale; the way the State can be satisfied that it will obtain the maximum price from the sale; and if he will make a statement on the matter. Minister for Finance, Michael Noonan : As the Deputy will be aware Goldman Sachs has been retained to advise the State on matters relating to the sale of Irish Life since April 2011 and this engagement, details of which have already been disclosed, is continuing. As I have stated previously the State intends to dispose of its holding in Irish Life as soon as market conditions permit. If a sale was to arise I would expect to be advised by my Department and its advisers. Deputy Pearse Doherty: To ask the Minister for Finance the most recent valuation of the State’s stake in Irish Life; the date on which the valuation was undertaken; if any persons outside his Department assisted in the valuation and if so, the names of same and the quantum of any fees paid for any external valuation..
Minister for Finance, Michael Noonan: As I stated in response to PQ 51139/12, the State paid consideration of €1.3 billion to acquire a 100% interest in Irish Life in June 2012. The shares are held at this value in the Finance Accounts and do not get revalued on a regular basis. In arriving at the consideration agreed in March 2012, information available to us from the sale process which was postponed in late 2011 was reviewed. A review was also undertaken of developments since that time in Irish Life and the Irish economy, movements in industry peer group valuation multiples and improvements in bond yields, particularly in Ireland. As you would expect I received advice from my officials on the valuation of Irish Life ahead of its acquisition in June 2012. In addition advice was also provided to my Department by Goldman Sachs who have been providing advice since 2011 in relation to Irish Life. This engagement has continued to date but no additional fees over and above those already disclosed have been incurred. Deputy Pearse Doherty: To ask the Minister for Finance the personnel responsible for negotiating on behalf of the State the sale of Irish Life, and if he will list their relevant qualifications and experience..
Minister for Finance, Michael Noonan : I will not refer to specific personnel but I can confirm that the State’s investment in Irish Life is managed by officials within my Department. Deputy Pearse Doherty: To ask the Minister for Finance the safeguards that exist to prevent staff in his Department involved in the sale of Irish Life, moving to work for the new buyer of Irish Life. Additionally, civil servants who hold positions which are designated positions for the purposes of the Ethics Acts shall not, within twelve months of resigning or retiring from the civil service accept an offer of appointment from an employer outside the civil service or accept an engagement in a particular consultancy project where the nature and terms of such appointment or engagement could lead to a conflict of interest, without first obtaining approval from the appropriate authority as outlined above. Even where the twelve months moratorium has elapsed, or where for other reasons approval is not required before taking up outside employment, former civil servants must continue to observe the restrictions imposed by the Official Secrets Act 1963, as amended by the Freedom of Information Acts. With regard to staff seconded from the National Treasury Management Agency (NTMA) to work in the Department’s Shareholder Management Unit on the sale of Irish Life, I am informed by the NTMA that its employees have notice periods of one or three months (and 6 months in the case of the Chief Executive). All NTMA employees are subject to section 14 of the National Treasury Management Agency Act, 1990 which prohibits an employee from disclosing any information obtained while carrying out their duties as employees of the NTMA. NTMA employees are also subject to the Official Secrets Act. Contravention of the NTMA Act and the Official Secrets Act is a criminal offence and the prohibition on disclosing confidential information applies indefinitely and extends to former employees. UPDATE: 19th February 2013. Minister for Finance Michael Noonan has this afternoon issued a statement in which he said that Irish Life has been sold to Great West in a deal worth €1.34bn comprising €1.3bn sale proceeds and €40m pre-sale special dividend. The sale is conditional on regulatory approval which shouldn’t be an issue. The redoubtable Mr Justice Peter Kelly is out of sorts. Not only is he a little upset that he is required to rule on matters in the Quinn saga, based on an Act, the IBRC Act 2013 rammed through the Oireachtas last week, without actually seeing a copy of the Act, because the bunch of drunks – literally in some cases based on the demeanor and outbursts of some and the fact the Dail bar was open until the wee hours – who voted to enact the emergency legislation early last Thursday morning to liquidate IBRC, has not bothered to make the Act available on the Government website. Judge Kelly has been operating on the basis that the Bill that he has sight of, was not amended before being signed into law – “not satisfactory” is the euphemism deployed by the Judge with having to rely on a Bill, but we know what he really means. This morning, the Government may be equally concerned at the approach taken by Judge Kelly in a NAMA case yesterday. NAMA is pursuing a developer Kevin McNulty over €88m loan facilities provided in 2009, and Kevin and his legal team are manouevring to claim that, because Anglo was insolvent in 2009, the loans were consequently negligently advanced and that this fact would mitigate, if not indeed wipe out completely, any liability. The upshot of the preliminary hearing yesterday at the High Court was that “an Anglo official” has to produce an affidavit in advance of the full hearing in June 2013, to confirm “yes or no” if Anglo was insolvent in 2009, and given the need to inject €25bn of promissory notes into Anglo in 2010, it is a safe bet that Anglo was indeed insolvent in 2009. And that being the case, the spectre has now been raised of the Judge dismissing NAMA’s application to recover €88m of loans, and Kevin McNulty walking away scot free. If the Judge allows this defence to be pursued then AIB – which received a €20bn bailout – EBS – which received a €1bn bailout – INBS – which received a €5.4bn bailout – PTSB – which received a €4bn effective bailout and even Bank of Ireland – which received a €4.7bn gross bailout, might all find that they cannot enforce loans which were provided between 2008-2010. Which may lead to further billions of loan losses in the banks – there will have been some new facilities in 2009, but other facilities will have been reconfirmed and received additional advances. NAMA yesterday disputed that any of this was relevant and we know that there are draconian terms in the NAMA Act which absolve NAMA of responsibility for the actions of the lenders whose loans NAMA has acquired. But we are awaiting a ruling or view from the Attorney General, MAire Whelan, from a referral by Judge Charleton last October 2012 as to whether these terms in the NAMA Act are constitutional.